Bark for Schools is proud to announce the all-new Family Alerts Dashboard. Now, schools will have the option of enlisting the support of parents in overseeing alerts from school-issued accounts. Bark for Schools helps protect — at no cost! — more than 1,000 school districts, so this new feature is going to be a game changer for keeping students safer online. 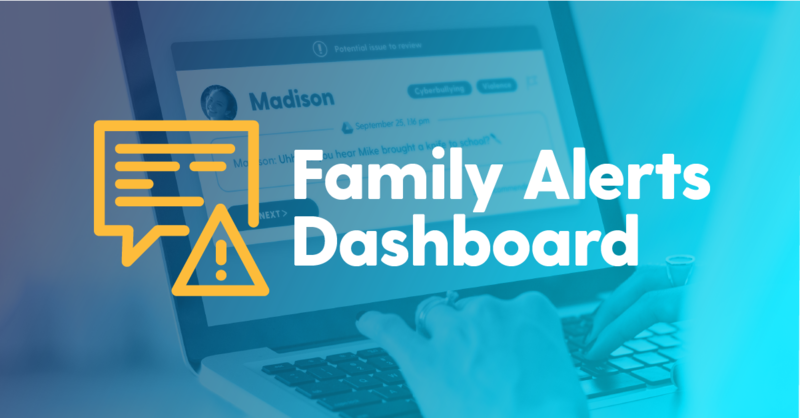 The Family Alerts Dashboard works with both Clever and PowerSchools to simplify the onboarding process. Schools that use Clever can sync family contact information, removing the need for schools to manually input data. PowerSchool integration — in addition to contact sharing — allows schools to easily incorporate Bark for Schools into their unified information system. To integrate with Clever, log into your Clever account and install the Bark app. We will then create unique activation links and send them to each parent on behalf of the school. Integrate with PowerSchool by logging in and selecting “Connect your school with Bark through PowerSchool.” This will similarly send out activation links. We truly believe our product is without peer, and that its life-saving capabilities are instrumental in protecting students. Our dedication to schools across the country is continually growing. The Family Alerts Dashboard is the most recent development in our ever-evolving technology and desire to improve. Bark for Schools is provided at no cost (forever! ), so the money schools save from costly tech can then be reinvested directly back into students — where it belongs. The Family Alerts Dashboard emerged from many different conversations as we spoke to schools. We learned that it’s important that parents know what their kids are getting into online. Families and schools both benefit from sharing the responsibility of receiving updates about potentially dangerous issues that arise from children’s accounts. At Bark, we sincerely hope that parents are excited about becoming active partners with their child’s school in the monitoring process. Often, these notifications are time-sensitive and can be imminent threats — the more hands on deck, the safer kids can stay. Visit bark.us/schools to learn more about Bark for Schools. And if you’re a parent, you can send your child’s school this video and this case study to show the value of Bark for Schools — and why they should start using this incredible free service.